Situated at the foot of Ben Lora which provides magnificent views of Lismore, Mull and Morvern, Ardchoille is ideally placed for touring Argyll, and is within easy reach of Glencoe and northwards to Fort William and Loch Ness (See Map). It is also very convenient (12 mins. by car) for Oban with its landmarks and tourist facilities. Oban is the ferry terminal for services to the islands of Mull, Iona with its historic Abbey and the Inner Hebredean islands of Coll, Tiree and Colonsay. There are also services to the outer islands of Barra and South Uist. 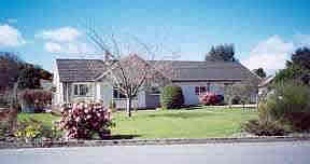 Ardchoille is a comfortable bungalow, family run as a bed and breakfast establishment, and provides a warm and friendly atmosphere. As owners, we aim to please our guests and make your stay as pleasant as possible. A Lounge for guests use is available. Two double bedrooms are available, both ensuite, one with Twin Beds and one with a Double Bed. A full traditional Scottish, or a continental style breakfast are available as required, and we will also provide to all dietary requests as far as possible. Our present rates for Bed and Breakfast are £30-£35 per person per night. Ardchoille Garden View is a self contained own door garden flat attached to the main house. Accommodation comprises a Lounge, Kitchen, and a Bedroom with Bathroom attached. The Kitchen is fully fitted out with cooker, fridge/freezer, washing machine and tumble drier. The Bathroom has bath and over-bath shower fitting. Our present rates are from £225 in low season to £375 in high season. Small private garden area to property with garden furniture. Private parking adjacent to Flat entrance. Locally in the village and within 2 mins walk is a popular café/restaurant and also within walking distance is an award winning licensed restaurant. In Oban, styled the sea food capital of Scotland, there are in addition to the excellent seafood restaurants, many other good quality restaurants. Using Ardchoille as a base there are many beautiful and interesting places to visit. The Sea Life Centre, five miles away, provides a close-up view of local fishes and other sea creatures and has proved to be a great place for children (some small species can be touched!) and in fact a great place for all ages. Further on, heading northwards past Castle Stalker is Appin, site of the infamous Appin murder which featured in Robert Louis Stevensons's book "Kidnapped". Further on still but only about 30 mins. drive is the Pass of Glencoe, scene of the infamous massacre of 1692. There is an Information Centre here where the story of the Massacre is portrayed, but it also tells of the wildlife that abounds in the glen and surrounding mountains. It is difficult to stand here and not feel in awe of the majestic scenery. Click Here for a photograph and the story of the Massacre. It is a "big picture" and may take time to appear but it is worth the wait. An hour's drive will take you to Glen Nevis and if you are fit for it, a climb up Ben Nevis - Britain's highest mountain. An easier mountain climb is at Aonach Mhor but you may find the Gondola a bit easier. Aonach Mhor is one of Scotland's finest ski areas and the Gondola station by the car park means that you don't have to be very fit to enjoy the magnificent views whilst having a refreshment or meal in the bar and restaurant at the upper gondola station. Further north, but a longer drive is Loch Ness where you may encounter the legendary monster but are more likely to have the pleasure of the spectacular scenery. We could go a great deal longer for there is so much to tell of the beauty and history of this part of Scotland's famous West Coast. Come and see for yourself - we will be delighted to be your hosts. Call within the UK 01631 720432: or outwith the UK 44 1631 720432.